Back in April this year, Apple made the announcement that its CarPlay software will come to the aftermarket via Pioneer Electronics and Alpine Electronics. While we all know that Pioneer will include CarPlay via a firmware update to its five NEX receivers, very little is known about what Alpine's plans are. 1. CarPlay-centric: Unlike Pioneer's NEX receivers, Alpine's version will be built with CarPlay in mind. CarPlay coming to Pioneer NEX was perhaps more like an afterthought. NEX receivers were announced at CES 2014 in January. It is unlikely that Apple had made plans to bring CarPlay to the aftermarket that early on. Being built with the sole idea of bringing CarPlay to the consumer, Alpine's head unit may work better than Pioneer's NEX head units. This is only a speculation though. 2. Hardware: Alpine's CarPlay head unit will obviously be a double-din receiver. Although initially thought to have a 7-inch screen, there is a slim chance it might feature a larger 8-inch screen. Alpine's latest double-din receiver features a larger screen (the 9-inch X009-U pictured above). Their X008U is an 8-inch version. Apart from doing CarPlay, it remains to be seen if the Alpine head unit will have a DVD drive, USB port/SD Card slot for other media, or standalone navigation. The touchscreen will more likely be resistive like most of the NEX receivers. 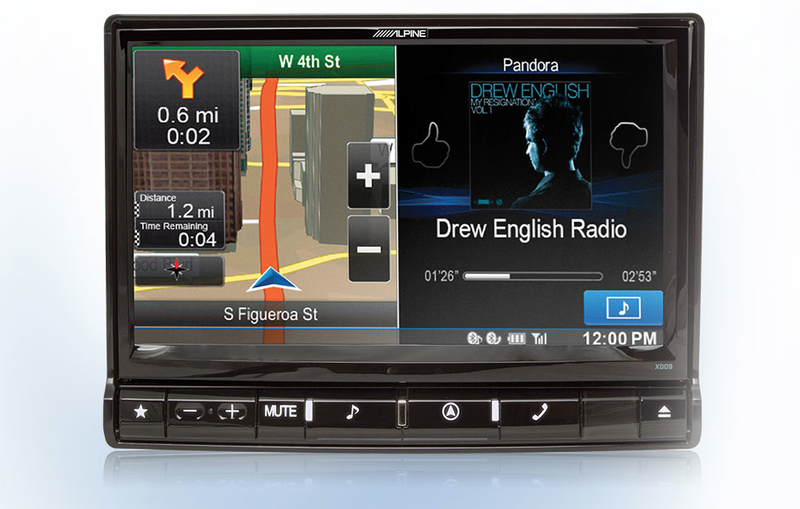 Only the AVIC-8000NEX features a capacitive touchscreen like the ones found in today's tablets. But a capacitive touchscreen drives prices up as seen in the price of the AVIC-8000NEX ($1400 at retail). 3. Software: A CarPlay-only device is less likely. For sure there will be additional radio functionality (maybe even HD Radio) at least. Other services like Pandora may be available too although Apple may bring Pandora directly to CarPlay at some point. Alpine, and Pioneer for that matter, will be hoping for more apps to become CarPlay compatible in the coming future. Right now, there are six third-party apps that will have CarPlay support. These are Podcasts, Beats Music, iHeartRadio, MLB At Bat, Spotify and Stitcher. 4. Price: Alpine has already suggested a retail price between $500 - $700 for its upcoming CarPlay head unit. That price may go up if additional features like a larger screen, capacitive touchscreen, in-built navigation etc. are added. 5. How many models? Will Alpine release more than one CarPlay device? Maybe an entry level head unit that does only CarPlay, and a higher-end device with some of the other features mentioned above along with CarPlay. Remains to be seen. 6. Release date: Reportedly, Alpine's CarPlay device is scheduled to be released sometime this Fall. Some reports even suggest 'early Fall' but we know how the 'early Summer' release for Pioneer has worked out. Nevertheless, Alpine's device is about two months away. CarPlay will definitely drive business for Alpine and Pioneer. Right now there is so much buzz around when Pioneer will release its CarPlay update for their NEX receivers. Consumers and non-consumers have been waiting for over a month now with very little to go by in terms of when. The NEX units were built with CarPlay in mind from the beginning, since CarPlay has certain hardware requirements. Apple hadn't finalized their CarPlay specifications until right around CES, which is why they waited until the Geneva Auto Show in March to introduce it.